The Piedra Blanca Rancho lords over the Pacific roughly halfway between San Francisco and Los Angeles. 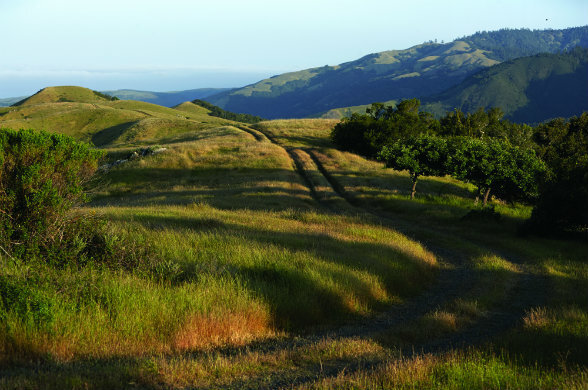 Grassland, native oaks, and chaparral cover its gentle slopes. 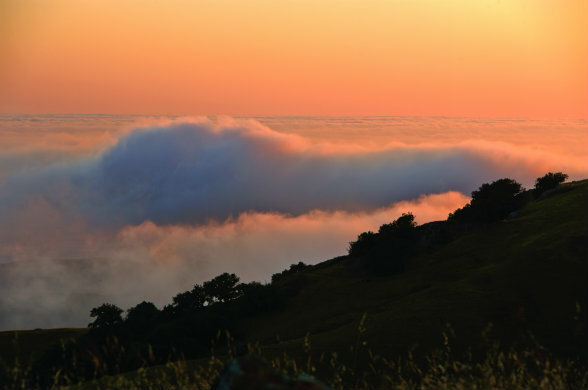 Coastal prairie extends from the foothills to the cliffs above San Simeon Bay. Rainfall runs up to 20 inches at sea level, and as much as 40 inches at higher elevations. Streams flow year-round from the Santa Lucias, a coastal mountain range running parallel to the ocean’s waters. During the warmer months, dense fog is a constant feature along the scenic shoreline. Known worldwide as the home of Hearst Castle, 82,000 acres Piedra Blanca Rancho is a landmark cattle ranch overlooking the Pacific Ocean. 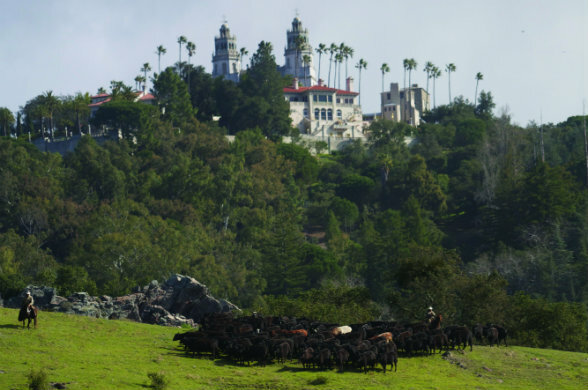 At its heart, San Simeon and its sister operation, the Jack Ranch, are traditional cattle outfits. In the winter, breeder bulls are turned out with cows. Calves drop in the fall. The following winter, mother cows and calves are rounded up for vaccinations. Gentle handling helps familiarize the calves with humans. It also minimizes the stress they endure. The newly branded calves are quickly reunited with their mothers and then moved into low-intensity grazing rotations that protect native range. Inland pastures are grazed first to allow coastal pastures time to mature for summer and fall grazing. Calves aren’t weaned until summer, when they’d naturally wean themselves. After weaning, steers and heifers are moved to the choicest pastures to put on weight. The specific locations are selected based on rainfall and recent grazing history. About 1,400 acres of irrigated pasture provide insurance against the severe drought that currently threatens more than half of California. Once the cattle reach about 1,200 pounds — ideally around the 18-month mark — they are moved to a facility certified for humane processing. Hearst Ranch has earned numerous humane handling certifications through the Global Animal Partnership. It’s a time tested approach, one that has been developed and improved by generations of Hearst Ranch cowboys and family members over the past 150 years. “We’re letting cows be cows, and giving them plenty of room to do it,” says Steve Hearst, the fifth-generation family member who runs Hearst Corporation’s ranching and timber operations as well as its real estate interests in San Francisco and Southern California. 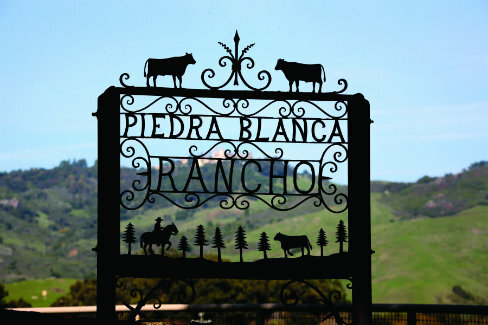 In addition to San Simeon, the family’s name for the historic 82,000-acre Piedra Blanca Rancho that surrounds Hearst Castle, the properties include the 71,000-acre Jack Ranch in Paso Robles and 61,000 acres of timberlands in Northern California. 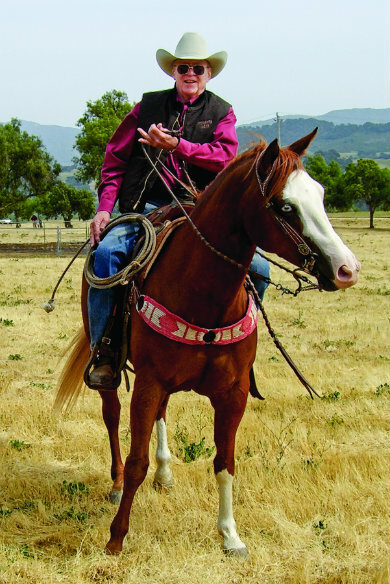 “I came over after 25 years at newspapers and, as a family member, had the privilege of growing up on these ranches and getting to play on them and also work alongside some of the cowboys with brandings and so forth,” Steve says. His arrival heralded an era of momentous change, one whose initial focus would be to develop a conservation easement for San Simeon. At 128 square miles, it is five times the size of Manhattan and it boasts miles of breathtaking Pacific Ocean frontage. “The conservation deal is something that required some pretty heavy lifting at the beginning because of all of the battles with the Coastal Commission over certain developmental opportunities at the ranch on the coast with some resorts and golf courses and so forth. I think we were fairly villainized, unreasonably so, but very villainized by some extremist environmental organizations and independent rock throwers from the local communities,” Steve says. 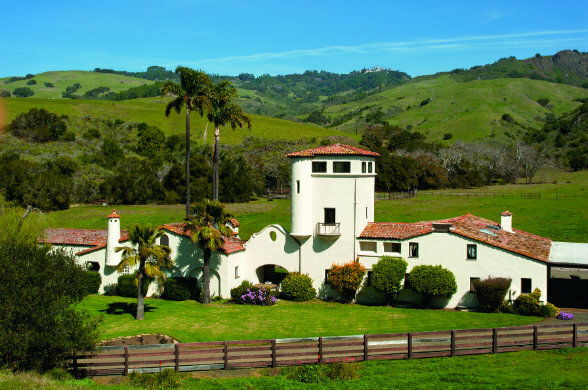 The San Simeon that George Hearst Jr. first glimpsed when visiting his grandfather W.R. in the 1930s has been cherished and nurtured by seven generations of the Hearst family. A landmark 2005 conservation easement ensures it will remain so for generations to come. In addition, there was another major constituency to take into consideration: the members of his own family. “This ranch obviously has a place in every family members’ heart. During the five years I was negotiating the conservation easement that closed in 2005, I was often heard to say that regardless of where any family member lives in the world, whenever they drive through the gates at San Simeon, they all think they’re home. And that’s very, very true,” he says. “Ultimately we convinced everybody that it was a good thing, and we reserved the right to build 27 owner homes and a small inn on San Simeon Bay. We haven’t built any of the homes, and we haven’t built the inn. We’ve got the rights to do it, and ultimately with the growing family I’m sure that some houses on the property are going to be necessary and desired,” Steve says. “They actually understand ranching and understand emergency needs of getting across creeks and rivers. They understand drought conditions and that the grazing may be a little bit more intense in those periods.” They understand those kinds of things, and they come and supervise the easement twice a year on site,” Steve says. Another major initiative got underway four years ago when Steve invited a delegation from Whole Foods to tour San Simeon. “A lot of operations claim to offer grass-fed beef, but they’re finishing their cattle on organic corn or something like that. We finish Hearst Ranch Beef on a 30-day mixture of alfalfa, bromes, and other non-grain forages,” he says. In addition, Hearst Ranch Beef is free of antibiotics. If an animal needs to be treated, it then gets an ear tag and is subsequently removed from the beef program. The response from Whole Foods to this approach was thoroughly positive. A contract was signed within 30 days. “The ranch is a great home court advantage, second only to the Oval Office,” Steve says. Nowadays, Hearst Ranch provides Whole Foods approximately 1,000 head, on a seasonal basis, from April to September. Thanks to this arrangement, Hearst Ranch is now the nation’s largest single-source supplier of free-range, all-natural, grass-fed and grass-finished beef. The majority of this production can be found at Whole Foods Markets in Santa Barbara, Santa Monica, Los Angeles, and other cities in Southern California. Closer to home, the Whole Foods Market in nearby San Luis Obispo is another venue. So are restaurants along the Central Coast, in the Bay Area, and as far afield as New York at cafe57 in the Hearst Tower. “The ranches are in better shape than they’ve been in for a long time due to our relationship with Whole Foods,” Steve says. 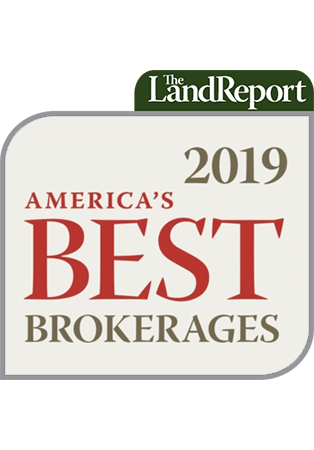 This long-term commitment to such high standards led the California Beef Cattle Improvement Association to name Hearst Ranch the Commercial Producer of the Year. After George’s death in 1891, Will (as he was then called) poured his energies into his growing media empire. In 1903, a day shy of his 40th birthday, he married 21-year-old Millicent Willison, a former vaudeville performer. 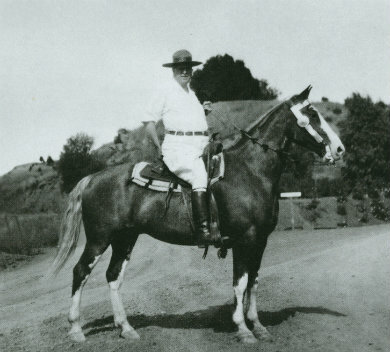 The arrival of five sons between 1904 and 1915 brought Will back home to San Simeon for he made sure that his boys knew the pleasures of camping, fishing, hiking, and riding in the same hills he’d loved as a child and as a young man. In 1919, Phoebe died of Spanish flu. Not long afterward, Will contacted Julia Morgan about “building a little something” at San Simeon. The rest is history. San Francisco architect Julia Morgan spent decades designing scores of structures at San Simeon, including the poultry ranch manager’s house (foreground) and the Hearst Castle (background). A prolific architect based in San Francisco, Julia was the first woman admitted to the prestigious École des Beaux-Arts in Paris. In addition, she was also one of the few Americans to complete the rigorous course of study. She had already undertaken several projects for the family, including a swimming pool for Phoebe at her 4,000-acre Pleasanton ranch and the headquarters of the Los Angeles Examiner for Will. The two engaged in initial discussions, and Julia decided to open Job 503 — the San Simeon project. Brief lulls notwithstanding, this job remained open for the remainder of Will Hearst’s life. From groundbreaking in 1920, until his death, Will maintained complete confidence in his chief architect. Julia designed hay barns, dairies, poultry farms, dams, bridges, fish ladders, walls, airplane hangars, employee quarters, animal pens, and, of course, the Hearst Castle. She laid out hundreds of miles of backcountry roads and took responsibility for hiring and firing construction managers. More than 1,000 letters and some 9,000 drawings make clear that Hearst, creative in his own right, indefatigable, and forceful, usually heeded Julia’s advice. Every design decision, every improvement to existing structures, sought a balance of functionality, beauty, and harmony with the land and the region’s aesthetic traditions. W.R. Hearst died in 1951. Six years later, the Hearst Corporation and Hearst family donated the hilltop buildings and 20 coastal acres to the State of California’s Department of Beaches and Parks. In 1958, Hearst San Simeon State Historical Monument opened to the public. At 128 square miles, San Simeon is five times the size of Manhattan. 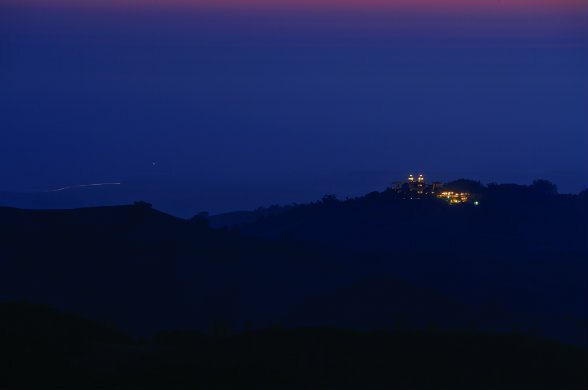 Since then, the 165-room Hearst Castle has welcomed tens of millions of visitors to its 127 acres. Yet few realize that the surrounding ranchland is being nurtured and worked just as it was during W.R. Hearst’s lifetime — and his father’s. 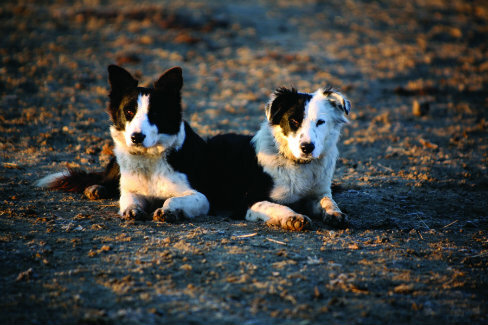 The ways of the American West, including training pups, are practiced on a daily basis by Hearst Ranch hands. Hearst Corporation is a global concern with immense reach: 15 daily newspapers and 34 weeklies; 21 magazine titles in the U.S. and close to 300 overseas; two radio stations and more than two dozen television stations; and a myriad of interests in many other ventures. Yet one asset stands above all. 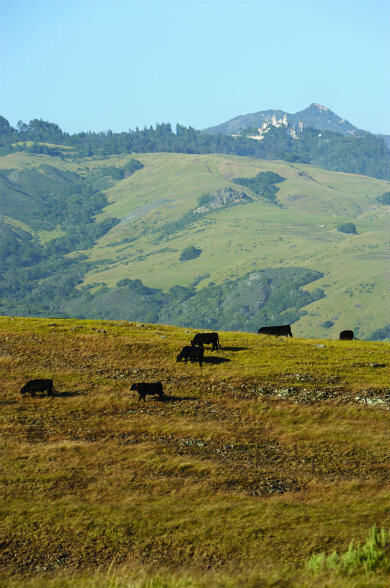 1 Pings/Trackbacks for "Land to Table: California Grass-Fed & Grass-Finished Beef"